If you have leaking faucets in the Richmond, VA area, our team can take care of you! Many types of faucets are serviceable, and our team is trained and experienced to fix just about every kind of serviceable faucet out there. Our vehicles are equipped with the common parts needed for many faucet repair jobs. If your faucet cannot be repaired, we can guide you on a practical and effective replacement that can meet your needs. 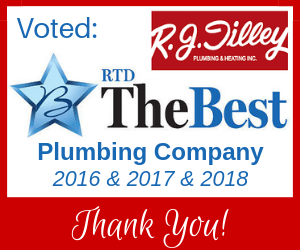 The plumbers at R.J. Tilley bring decades of experience and will take the care to get the job done right. Our team is made of fully trained master plumbers, and aren’t trained in “sales” nor do they have quotas to sell you additional products or services you don’t need. We’re proud to offer excellent customer service and have earned high ratings on our online reviews on Google and Facebook, as well as a A+ Rating with the BBB. Not repairing a dripping faucet can cost you more money than you may think. Dripping faucets lose a considerable amount of water. The USGS has a drip accumulator calculator at the U. S. Geological Survey Site shows you how much water might be wasted by a dripping faucet. You just enter the number of homes, the number of dripping faucets in each home and the number or drips per minute and calculator tells you how much water is wasted in both liters and gallons per day and per year. For example, if you have 20 drips per minute. You are paying for 1 gallon per day which can add to as much as 694 gallons “down the drain” in a year. Dripping faucets, one of the most basic plumbing issues, are usually a minor service repair that can be done in minimal time and save you the cost of the dripping faucet over the year of the drip.